Martha Newbern Guthrie was the wife of Samuel F. Guthrie, and the daughter of Dred Newbern and Elizabeth “Betsy” Sirmans. According to her grave marker, her birthdate was April 10, 1836. The papers recording her date of death all show that she died on February 23, 1925. Martha Newbern Guthrie was a lifelong resident of Berrien County, Georgia and generations of her descendants have made their homes at Ray City, GA. Her husband, Samuel F. Guthrie, fought in the Civil War in the 54th Georgia Volunteer Infantry. After his death in 1910 she applied for and eventually received an annual Confederate Widow’s Pension. Her last application paperwork documents her death and burial arrangements. The doctor’s bill, the bill from W.H. 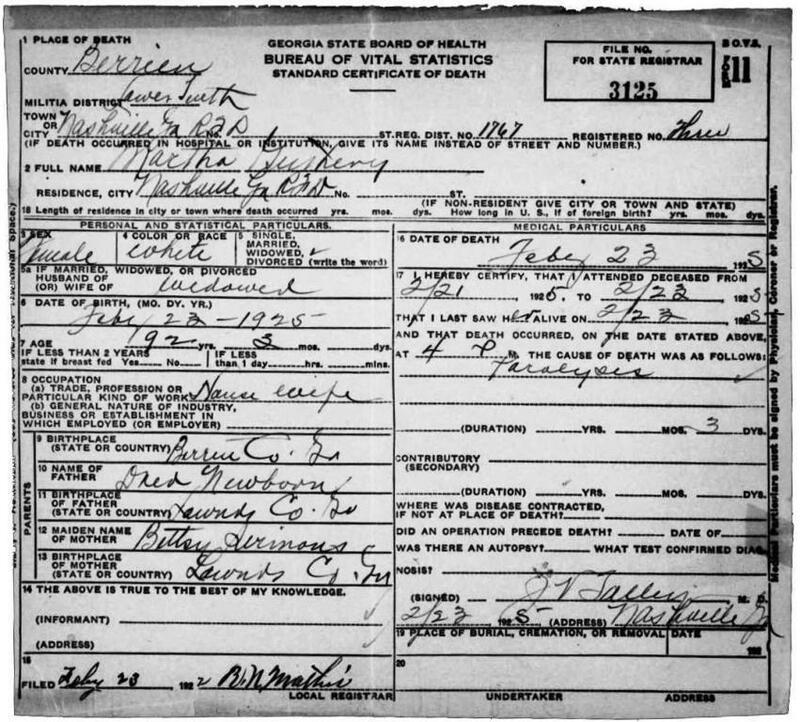 Tygart for funeral arrangements, and the death certificate itself all confirm her death occurred on February 23, 1925. Why then does her grave marker at Guthrie Cemetery, Berrien County, Georgia give her date of death as January 25, 1925? Gravemarker of Martha Newbern Guthrie gives her death date as January 25, 1925.